A recent article in the online journal Nature Communications confirms that the complex topology of the magnetic field of Wendelstein 7-X—the world's largest stellarator—is highly accurate, with deviations from design configuration measured at fewer than 1-in-100,000. To measure the magnetic field, the scientists launched an electron beam along the field lines. They next obtained a cross-section of the entire magnetic surface by using a fluorescent rod to intersect and sweep through the lines, thereby inducing fluorescent light in the shape of the surface. 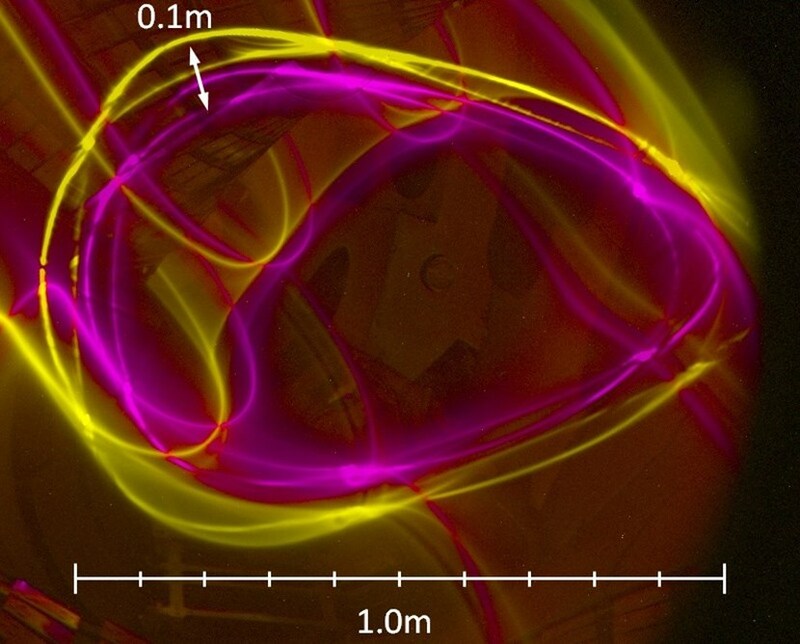 In the complex shape of a stellarator, high engineering accuracy is needed because even the smallest magnetic field errors can have a large effect on the magnetic surfaces and the confinement of the plasma. Wendelstein 7-X relies on a system of 50 non-planar and superconducting magnet coils to create a precisely shaped magnetic "cage" to confine the plasma for discharges of up to 30 minutes (projected). Following a first helium plasma in December 2015 and an initial hydrogen campaign with over 2,000 plasma pulses, the machine is now being prepared for high power operation at the Max-Planck-Institute für Plasmaphysik (IPP) in Germany. Because a carefully tailored topology of nested magnetic surfaces is necessary for optimum confinement, the study's highly sensitive measurements provide welcome proof that such a topology is feasible and verifiable with the required accuracy. Read the original article in Nature Communications. Other reports at IPP and the Princeton Plasma Physics Laboratory, PPPL.